This is old stuff! Many external links no longer work. Posted our Budget for 2008. Posted our Program for 2008. Added info on Vietnam's motorcycle helmet law. Posted our Helmets for 2008 page. Sent out an Update on a Specialized helmet recall. Added a new source of posters to our Posters page. Posted a preview of our Helmets for 2008 page. Posted a new story on our Crashes page. Added Mike Heikes to our page on head-injured folks. Added new NHTSA stats to our Statistics page. Added ICS Laboratories to our Testlabs page. Updated deadlines and staffing on our ASTM F8.53 Helmets and Headgear Subcommittee page. Posted email feedback on our Hearing Aids page. Added new references on our Journals page. Updated links and other info on our Helmet Laws page. Added a page on thinner helmets. Finished a summer project to validate all of our links. Added another visor injury story to our Visor page. Added LED Helmets to our our Helmets for 2007 page. Added a link to the free teacher's resource guide from the Bike Smart program. Added heel wheel roller shoes to our page on Other Helmets. Added a page on Our test of rolling over a helmet in a car. Added a page on reports of a truck rolling over a helmet. Added new data on the cost effectiveness of helmets to our statistics page. Added links to new materials available from DOT/NHTSA. Added a link tothis .wmv clip on how to fit a helmet from DOT/NHTSA. Added new articles to our Journals page. Added a new Helmet Fit Checklist. Posted a link to John Schubert's hilarious takeoff on the Walker study of passing distances. Added New Mexico to our list of mandatory helmet laws. Posted a photo of BHSI's Randy Swart receiving an ASTM award. Posted a Helmet terms and definitions page. Sent out our first Helmet Update for 2007. Posted our Helmets for 2007 page. Totaled up our Web visitors for 2006: 852,152 distinct hosts looked at 3.2 million of our pages! Updated our pamphlets and other materials to 2007 versions. Posted a draft agenda for the spring ASTM F8.53 headgear subcommittee meeting in Norfolk. Updated our page on removing helmets from children using playgrounds. Added information on new products to our page on helmets and hearing aids. Added new videos to our page on helmet safety videos. Updated our page on Helmet History. Added new statistics to our statistics page. Finished putting up our Update newsletters going back to 1983. Sent an email Helmet Update on a British study on helmets and passing clearance from cars. Added a page on a British study on helmets and passing clearance from cars. Updated our references to the North Carolina study of British Columbia's helmet law. Updated our Patents page, adding some interesting new ones. Posted the first draft of an agenda for the ASTM F8.53 Helmet and Headgear Subcommittee meeting in Atlanta. Added an EPS foam recycler to our page on recycling helmets. Added CASCO to our Helmets for 2006 page. Revised our page on how to encourage kids to wear helmets. Revised the list of what we need. Updated the info on BSI on our Test Labs page. Added a link to the description of a prize-winning Science Fair project on helmets. Updated our page on helmet-related patents. Sent out the Task List from our ASTM Subcommittee meetings in Toronto. Added a page of smashed helmet photos. Added Dr. Pietro Tonino's numbers for injuries in US sports to our statistics page. Added new helmets to our page on helmets for both bicycling and skateboarding. Posted a draft agenda for the fall ASTM F8.53 headgear subcommittee meeting in Atlanta. Sent out an Update on the new Consumer Reports helmet article. Sent out an Update on Trek's recall of Anthem helmets. Added a link on our Journals page to a report on a study on skull fractures in lab testing. Added a page on thinner helmets for very small adult heads. Added a page of ideas on getting your kids to wear helmets. Sent out an Update on the CPSC guide "Which Helmet for Which Sport." Added rugby to our page on Other Helmets. Updated Florida info on our mandatory helmet law page. Added pogo stick helmets to our page on Other Helmets. Added a new skateboard helmet pamphlet. Posted the first agenda for the ASTM F8.53 Subcommittee meeting in May. Added wheelchairs to our page on Other Helmets. Added a page of definitions of helmet types. Sent out an Update on Helmets for 2006 and NHTSA stats released. Added a link to NHTSA's latest data on cyclist injuries. Updated all of our pamphlets and many other pages for 2006. Added a page on chrono-shaped time trial helmets. Posted our budget projections for 2006. Added a maze and a connect-the-numbers. Added a letter to Sports Illustrated Kids to our page of protests about bad advertising. Added Bell's survey result showing that just over 40% of kids wear helmets to our Stats page. Added a preview summary of Helmets for 2006. Added minutes of the ASTM technical meeting in Dallas. Added a reflective helmet to our page on reflectivity. Added new articles to our page of journal articles. Updated our History of Helmets page and added lots of photos. Added A Kids Eye View to our videos page. Updated our statistics page with new data from CPSC. Added a book review of Mick Harte was Here, a book about the death of a cyclist used in classrooms. Added a page on recycling your old helmet. Added Suffolk County, NY to our mandatory helmet laws page. Added a new video for tweens to our Videos page. Added Sierra Vista, AZ to our mandatory helmet laws page. Sent out an Update on a recall of 494,000 Target helmets. Posted a helmet workshop outline. Posted a page on helmet testing. Posted an page on helmet performance limits. Posted an article from the French CSC recommending helmets. Posted a brief on helmet law opposition in the UK. Sent out an Update on a NHTSA study of helmet laws. Sent out an Update on a motorcycle helmet article. Added a page on the Reevu helmet with mirror. Posted Reno minutes of the ASTM Equestrian Task Group. Added the NOCSAE site to our links. Added New Hampshire to our mandatory helmets page. Added a page on helmets for seniors. Added a page on the perils of buying a used helmet at a yard sale. Sent out an Update on an Australian standards study. Added a study on alcohol and bicycle head injuries in Finland. Added a Word file with our complete Toolkit for Helmet Promotion Programs. Added a page on helmets certified to both skate and bicycle helmet standards. Added a page on publications available from US DOT / NHTSA. Added Eastchester, NY to our list of mandatory helmet laws. Added a page on the cost of making a bike helmet. Added links to the WABA bike safety site with on-street class manuals. Added a page on The Global Market for Helmets. Sent out an email Update on Helmets for 2005. Posted our full review of Helmets for 2005. Added Bethel, AK to our list of mandatory helmet laws. Completed our year-end update of all links on the site. Added a link to the December issue of the World Health Organization's December newsletter, Headlines. Added a page on Helmets for special needs. Expanded our site map to a complete listing of our 868 pages with links to each one. Added a page on How Helmets are Made. Added a page on replacing buckles. Added Marietta, Ohio to our list of mandatory helmet laws. Added four Ohio cities to our list of mandatory helmet laws. Posted the ASTM soccer headgear Task Force minutes from our DC meeting. Posted the ASTM helmet subcommittee Task List from our DC meeting. Began posting ASTM helmet subcommittee agendas and info for our Reno meeting. Posted the final ASTM helmet subcommittee agenda for our DC meeting. Posted the Minutes of the ASTM Salt Lake meeting in May. Posted a link to an ASTM magazine article about helmet standards. Posted an article about Bell and Giro time trail helmets. Added a sneak preview of Helmets for 2005. Added a page for bike shop owners. Added a Limar poster to our poster page. Added a book review: Mick Harte was Here. Added a page on strap creep and why helmets loosen in use. Revised our page on cooling to add new information on Swiss testing of helmet cooling. Revised our list of mandatory helmet laws to update Massachusetts to under 17. Updated the graphics in our pamphlet on How Children See Traffic. Added Michelin Helmets to Helmets for 2004 page. Posted our Email Update on a PTI/Schwinn toddler helmet recall. Posted details on our recalls page. Posted a page on Bell Sports' acquisition by Fenway Partners. Posted Professor Hugh Hurt's email about problems with aero-style helmets. Posted our Email Update Professor Hurt's request to ASTM. Posted our Email Update on a Geartec and DBX helmet recall. Posted a page on reflective materials on helmets. Posted a page on trailbikes. Posted our Email Update on the Consumer Reports article. Posted a review of the July Consumer Reports helmet article. Added Enon, OH to our list of mandatory helmet laws. Posted a study by the State of Utah on helmet wearing rates. Posted Minutes of the November ASTM Shirtsleeves technical meeting in Tampa. Posted Minutes of the November ASTM meeting in Tampa. Posted our Email Update: helmet usage survey. Posted an article about Bell Sports seeks new owner. Posted a note about the Consumer Reports bike helmet article coming in their July issue. Posted a Brief on Safe Kids head count study to be announced on May 11th..
Posted our full review of Helmets for 2004. Sent an email newsletter about Helmets for 2004. Added Dayton, OH to our list of mandatory helmet laws. Added Lawrence, KS to our list of mandatory helmet laws. Added a page on helmets for powered bicycles and scooters. Added a description of an Australian helmet promotion program. Updated our collage of helmet ads. Prices are up! Added a page on where to find famous gelatin brain mold. Posted new 2004 versions of our pamphlets. Updated Safe Kids/Bell Sports pricing on our inexpensive helmets page. Added a page of helmet tongue-twisters. Added a page on the effects of wearing do-rags or head coverings with helmets. Posted another sad story on our page on visors. Posted results of our sticker testing. Posted Steve Meiers' study on Promoting Helmets in Poor Neighborhoods. Added Florissant, MO to our list of mandatory helmet laws. Revised our Web page format. Added a description of the Consumer Reports article on ski helmets. Added a Dutch report on helmet promotion. Added a comparison of ASTM standards. Added a page on helmets for winter riding. Added a page of other peoples' letters to the media on bad ads that need no comment from us. Added a summary of Helmets for 2004. Added Blue Ash, Ohio to our list of mandatory helmet laws. Updated the NEISS statistics on our Statistics Page to 2002 totals. Added Brunswick to our examples of those fined by CPSC. Added the East Cleveland helmet law to our list. Added a wrod gmae taht is a cahllnege to raed. Sent out an Update email newsletter about CPSC's study of recalls and the Safe Kids project to measure helmet use. Added an article on Bell's use of infomercials. Added a scooter crash story--no helmet!. Added a brief on the new Safe Kids study of helmet use. Added a page on helmet posters. Added a second crash story page for non-bicycle or non-helmeted crash stories. 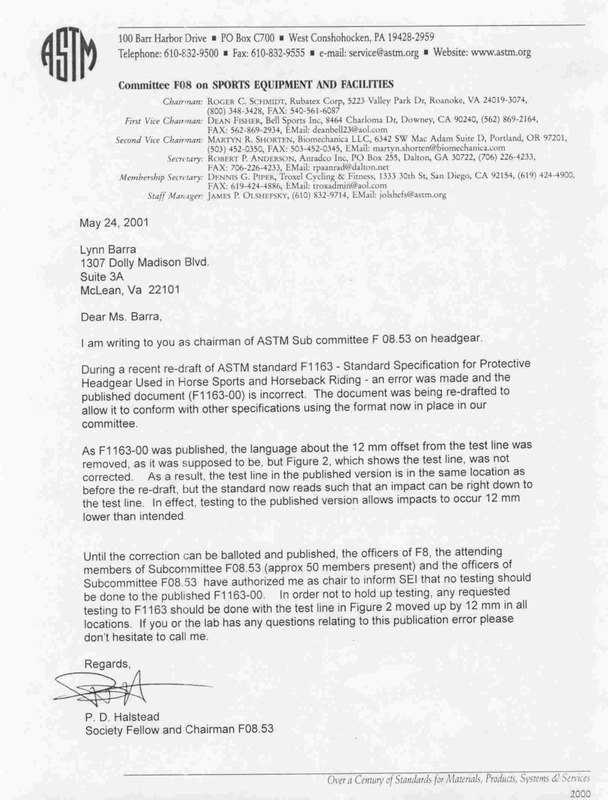 Added comments to our FOIA request to CPSC seeking a list of their helmet compliance cases. Added a short version of our helmet fitting advice. Sent out an Update email newsletter about the Falmouth, Massachusetts study on helmet fit and ANSI adopting ASTM bike helmet standards. Added a page, a brief and a comment on our Quotes page about the Falmouth, Massachusetts study on helmet fit. Added a brief on the extension of the King County, WA bike helmet law to cover Seattle. Added a Brief about ANSI at last adopts ASTM bicycle helmet standard. Added a link to CPSC's entire file on the 1999 Bell Sports recall of three models. The link is on our recalls page. Added the abstract of a Swedish study on effectiveness of helmet promotion measures. Added a note to our recalls page about CPSC's non-recall of some helmets that flunk their standard. Added our FOIA request to CPSC seeking a list of their helmet compliance cases. Added photos of the CPSC helmet test lab. Added a paper on test anvil finishes. Added a map of the US highlighting helmet laws. Completed a major update of our mandatory helmet law page. Posted a new page on helmets and hearing aids. Posted an Update by Email on the Catlike USA helmet recall. Posted a brief on the adoption by the UCI of a mandatory helmet rule. Added a link to a UK study on helmet effectiveness geared toward decision-making on mandatory helmet requirements. Totaled up our hits for 2002: 1.1 million pages served to 327,772 users! Added Columbia, MO to our mandatory helmet law page. Added a page on how CPSC can override a non-working voluntary standard with a law. Added a page on cleaning your helmet. Added links to the terrific California Department of Health Services helmet program materials. Posted an email Update on a MOSA Sports helmet recall. Added a review of the Bike Magazine article on four 2003 helmets. Added a brief on the death of European racer Andrei Kivilev. Added a link to a fine article on measuring helmet use from CDC. Posted minutes for the Pittsburgh and Miami ASTM meetings. Posted a new page on a how to send a defective helmet to CPSC. Posted a new quote on a Reuters article questioning helmet effectiveness. Posted new 2003 versions of our pamphlets. Posted our Budget projections for 2003. Posted our BHSI Program Plan for 2003. Posted the ASTM F8.53 Subcommittee task list from our Miami meeting. Added a page on Bell to sell motor sports helmets again. Added a new page on helmet patents. Added info on Louisville's new helmet law. Added a page on age guidelines for children and ride-on equipment. Added materials from a grieving parent's helmet campaign. Added info on Finlands's new helmet law. Added a page on research needed to make progress in helmet standards. Added stats from CPSC on national injury rates for 2001 to our statistics page. Revised the formatting of our Web pages to be more friendly to a variety of browser page sizes and different settings for screen resolution. Added a new foam concept called SALi to our page on helmet foams. Added a new page on full face helmets. Posted Highlights of Helmets for 2003. Added a study of chin strap forces and sliding resistance. Posted the draft agenda for the Miami ASTM meeting. Added a quote on helmet laws and fitness. Added a page on The ideal bicycle helmet standard. Added info on California's law covering scooter, skate and inline skate helmets. Added a brief on a CPSC study on the effectiveness of State helmet laws. Added a page on helmets and turbans. Added advice for students doing term papers. Added a Brief on PTI licensing the Schwinn brand for helmets. Added a page on helmets for toddlers with very large heads. Added Madeira, Ohio to our list of mandatory helmet laws. Added a quote on the use of helmets in the 2002 Tour de France. Sent an Update on the Today Show helmet segment scheduled for July 12th. Added an article on New Zealand's helmet wars. Added a Brief on a new French helmet campaign. Added Duval County helmet usage numbers to our statistics page. Added a pamphlet version of how children see traffic. Added a page on multi-purpose helmets. Added a page on why don't low-income kids wear helmets. Updated our Consumer's Guide and child helmet pamphlets. Added a page on When can I ride again after a crash. Added two Nevada reservations to our Mandatory Helmet Laws page. Added a page on managing "helmet hair". Added a page on Phoenix Children's Hospital/Safe Kids of Maricopa County program materials. Added a page on how children see traffic. Added a page on bicycle rider education sources. Added a Brief on the new French helmet campaign. Sent an Update on the new Consumer Reports helmet article. Added a page on Training helmet fitters. Sent an Update on the new anti-concussion football helmet by Riddell. Added a link to a new page summarizing an upcoming study of how helmet laws are made. Added new info on pole vaulting helmets..
Added a presentation on the National Strategies for Improving Bicycle Safety.. Sent an Update on the National Safe Kids helmet campaign launched on May 2nd. Added a page on the National Safe Kids helmet campaign. Added Canada's New Brunswick and Alberta to our list of mandatory helmet laws. Posted Voigt Hodgson's first study on the sliding resistance of helmets, the precursor to his 1991 study with more variables, but still another landmark study. We have a .pdf version too if it works better for you. Posted Voigt Hodgson's 1991 study on the sliding resistance of helmets, a landmark study. Added info on Minnesota's Train the Trainer helmet workshop. Posted a draft agenda for the ASTM meeting in Pittsburgh in May. Posted an original study on helmet effectiveness by Grant and Rutner. Sent an email newsletter with that news and the DOT video announcement. Added a brief on the new free video from DOT. Listed a new free video called Ride Smart. Posted a new page on helmet graphics. Started an experiment on sticker compatibility. Added a quote on helmets for pole vaulters. Added the enabling legislation for Virginia helmet laws. Added a Search button to the top of our home page. Added the Draft ASTM Pittsburgh meeting schedule..
Added a brief on a study showing concussions can bring on Altzheimer's..
Added a page describing What is a "g" ?. Added Bainbridge Island, WA to our helmet law page. Revised our page on hair styles in response to a reader comment. Added a page describing the CPSC streaming video on helmet testing and fit. Added a link to De Clarke's page of Helmet War URL's. Posted a Task List for the ASTM Dallas meeting. Posted our review of Helmets for 2002. Sent an email newsletter on Helmets for 2002. Posted our budget for 2002. Posted our work program for 2002. Added a page on bike helmets in very cold weather. Added a DC bill to add scooters to the bike helmet law. Added a page on helmets for the new Segway scooters. Resumed posting our weekly server stats. Added .pdf versions of our pamphlets. Added a page on one-size-fits-all helmets. Added a page on other bike safety equipment. Started a page of references to medical journal articles. Added a page on our mail and the anthrax scare in Washington. Added a link to ASTM's Award of Merit to Dave Halstead. Added a link to the IISA page on helmet laws for skating. Added a brief on a new playground hanging incident. Added an outline for a bike safety talk. Added a page on helmet promotion materials in Spanish. Updated our page on the status of ASTM standards. Added a page on what a helmet does in a crash. Added a page on helmet cooling and ventilation. Added a brief on the CPSC motorized scooter helmet recommendation. Added The Bicycle Zone to our Videos page. Added a brief about a helmet recall by World Industries. Added helmet use observations by Scott Osberg to our stats page. Added links to Institute for Traffic Safety Analysis data. Updated our comment on the New York Times helmet article. Added a page of Public Service Announcements. Posted comments on a New York Times article. Revised the ASTM F8.53 helmet Subcommittee task list. Posted the latest Helmet Update by email. Added a great helmet fit video to our videos list. Added North Carolina to our list of mandatory helmet laws. Added Louisiana to our list of mandatory helmet laws. Added St Louis County, MO to our list of mandatory helmet laws. Added a page on braided hairstyles and baseball caps. Added a notice on ASTM's equestrian helmet standard. Added a page on projects for new pages on our site. Added some material on skateboard helmets. Expanded our page on threading straps through buckles. Posted a new national bike safety campaign!. Added Matthews, NC to our list of mandatory helmet laws. Added Akron, OH to our list of mandatory helmet laws. Added a page of Tips for Riding on Campus. Added a page on Helmets on Campus. Posted an announcement of a new national campaign. Added a page on fitting helmets to rounder heads. Added Greenville, NC to our list of mandatory helmet laws. 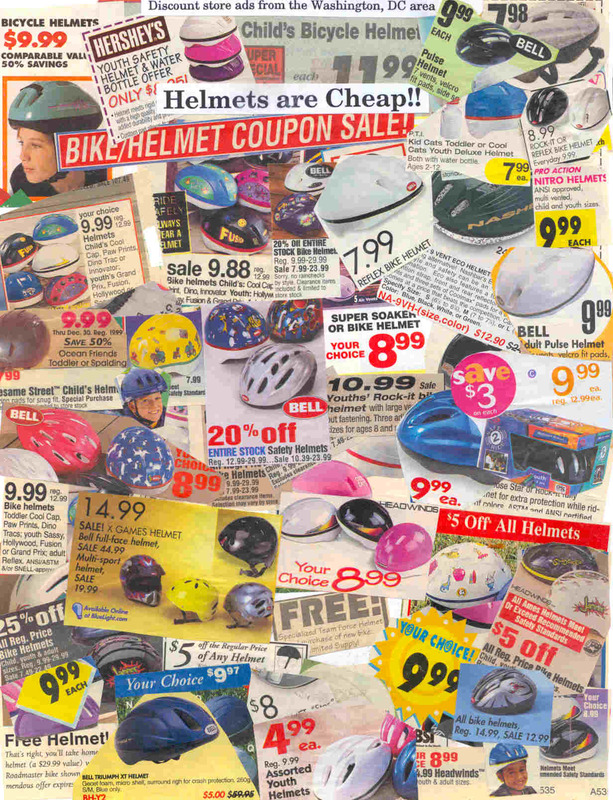 Posted our collage of many ads for cheap helmets. Posted a CPSC Request for Comments on the bike helmet program. Posted results of a study on drinking and riding. Posted the Bike rodeo material from Ride Safe with their permission. Added the Minutes from the ASTM F8.53 Subcommittee's November meeting. Received the Smokin' Site Award from the Tennessee Fire Prevention Assn. Added notes on our ideal helmet page on why the ideal is not available. Posted our program for 2001. Posted a page on Skateboard helmets for bicycling?. Posted our Budget for 2001. Posted our review of Helmets for 2001. Added a page explaining molded in the shell helmets. Added a copy of the District of Columbia helmet law. Added Glendale, Ohio, to our list of mandatory helmet laws. Added the District of Columbia to our list of mandatory helmet laws. Sent an email newsletter with info on a new helmet recall. Posted our review of the Dateline coverage of the helmet recall. Posted a new page on equestrian helmets. Updated our page on helmet use in Vietnam. Posted a brief on a British article finding helmets effective. Added a graphic on how a helmet should fit from the CPSC server. Posted the ASTM F8.53 actions list from the May meeting in Toronto. Added info on our other helmets page about CPSC's warning to scooter riders to wear helmets. Added a new helmet law to our mandatory helmet law page: Bremerton, Washington. Took down our page of programs seeking donations: the addresses on it were being spammed..
Added some info on helmets for wakeboarding. Added some info on helmets for scooters. Added the text of Hawaii's mandatory helmet law. Updated data on the helmet law in Brecksville, OH. Added a new helmet law to our mandatory helmet law page: Aberdeen, Washington. Added some data on the effect of helmet laws in Duval County, Florida to our mandatory helmets page. Added CPSC's statistics on baby boomer bike injuries to our stats page. Added a Search function to our site. Added the Minutes from the ASTM F8.53 Subcommittee's May meeting. Updated our Recall Page to add the two recalled on July 5th. Added a link to Harborview's Evaluation of 15 bicycle safety programs. Posted a brief on the recall of two helmets announced by CPSC. Posted a brief on the helmet campaign in Wadley, GA.
Posted agendas for the May ASTM helmet committee meetings in Toronto. Added a page on NHTSA's fall safety program: Getting to School Safely. Added a page on our exhibit at the Smithsonian. Added a link to this page of medical journal abstracts. Posted our Helmet Update on paper, the longer version. Posted our Helmet Update by email. Posted our annual review Helmets for 2000. Added a link to the Swedish Bicycle Helmet Initiative. Added a brief on the rejection of an extension of the Tennessee helmet law. Added a brief on the CPSC forum planned for May 2nd on repetitive impact head injury. Added a link to the National Conference of State Legislatures mandatory helmet law page. Added a page on our problems with our new DSL connection. Added a page on our exhibit at the Smithsonian in May. Posted our January 19 Update by email. Added a 1995 survey on why kids say they do not want to wear a helmet. Added a brief on a new helmet design using LED's to show correct fit. Added a brief on the Oakwood, Ohio, direction to police to educate cyclists and encourage helmet use. Added a "resolution" adopted in Oakwood, Ohio to our mandatory helmets page. Posted the Minutes from the December ASTM F8.53 Subcommittee meeting in New Orleans. Added a link to the new TRIS search page for researchers. Changed over to our new DSL high speed Internet link. All BHSI computers, Web servers, mail servers, routers, network monitors and workstations are Y2K OK! Added a page for email notifications when our pages change. Added a CPSC warning to our page on snow sports injuries. Updated our ASTM meeting agendas. Added information on sledding helmets. Posted updates to our ASTM materials after a semi-annual ASTM meeting. Added a link to a manufacturer of helmets with built-in blinking LED's. Added a page on disadvantages of too many vents and square helmet styles. Added a description of a study of helmet usage and the effects of laws in New York State. Added a link to a manufacturer of helmet cameras. We're rated accessible to disabled browsers according to the Bobby analyzer. Updated our material on soccer headgear. Added a link to a head injury site by psychologist Diane Roberts Stoler. Added a link to a manufacturer of soccer headgear for kids, Headblast. Updated our page on the status of ASTM helmet standards. Posted the Minutes from the May ASTM F8.53 Subcommittee meeting in Seattle. Added a page with our approach to bike lights (heavy!). Added a page of suggestions for parents of teenage riders. Added a CPSC interpretation modifying their bicycle helmet standard. Added a summary of ASTM F8.53 actions in Seattle. Added a page of tips on getting statistical info from CPSC through FOIA. Added a page on the new Pennsylvania Bicycle Driver's Manual. Added a page on using stickers on bicycle helmets. Added a brief on a book about Jeff Pence's head injury in a bike crash. Added a link to the new Protective Headgear Manufacturers Association page. Added Maine to our List of Mandatory Helmet Laws. Added Spain to our List of Mandatory Helmet Laws. Posted a note on the Bicycling magazine article on us in their July issue..
Posted a new page of Summer Riding Tips. Updated our report on the Status of ASTM Helmet Standards. Posted the Agenda for this week's ASTM headgear subcommittee meeting. Added a review of the new helmet article from Consumer Reports. Added a brief reviewing a new helmet article from Consumer Reports. Added a link to Doug Mink's blockbuster page of links to bicycle helmet laws. Added PHMA's free Professor Helmut on Helmets to our list of videos. Added an article from BRIN on playground deaths involving helmets. Added a link to the Rad Rider site with its dynamite graphics! Added a page on the new graphical helmet sites for young riders. Added a page listing Helmet Recalls. Added a page on how to contact CPSC with a defective helmet report. Sent an Email Alert on Bell's recall of 5,800 downhill and BMX helmets. Sent out an Email Update on the CPSC/McDonald's helmet promotion campaign. Added a link to the new helmet page sponsored by McDonalds and CPSC. Added helmet usage estimates from a CPSC study to our Statistics Page. Added a link to the bike rodeo page at Transportation Choices. Added a page for students and other researchers on the design and construction of helmets. Added a Brief on the repeal of Seymour, Connecticut's helmet law. Added a review of a new Disney bike safety video. All helmets made for sale in the US after today must meet the CPSC standard. Added two articles about Bell Helmets and Giro. Added the CPSC warning on playground incidents involving helmets. Added page on playground accidents involving helmets. Added draft minutes of the ASTM meetings in December..
Added the January issue of The Helmet Update. Added a brief on a study of bike safety training programs. Added a description of NHTSA's bike safety initiatives. Added the text of a pamphlet available from DOT on helmet fit. Added a link to the DOT Web pages on child bicycle safety. Added a link to the youth-driven Earth Force environmental program Web page. Added a press release from CPSC recommending snow sport helmets. Added Jeanne Smith's helmet quiz for 5th & 6th graders. Added a section about soccer helmets to our page on non-bicycle helmets. Added a Brief about SEI certification of some Bell models to the CPSC standard. Posted a local program in need of assistance on our donations page. Added a Quote of the Day recommending helmets meeting the CPSC standard. Posted a task list from the ASTM Nashville meetings. Squeezed our graphics a little more to make the home page load more quickly. Added a link to the Brain Injury Association. Ended our video lending program. We couldn't get them back..
Added a page on shattering and snagging visors to encourage victims to report incidents. Added an article on a French ski helmet campaign. Added a History of Bicycle Helmets. Added a Brief on 1999 helmets. Added 1997 data from the Insurance Institute for Highway Safety to our Statistics page. Added a Quote of the Day to buy helmets meeting the CPSC standard. Updated recommendations in the Standards section of our 1999 Helmets page. Put up a new page of Needy Programs looking for donations. Took it down 8/00 when addresses were spammed. Posted the first edition of our report on Helmets for 1999. Updated our page on inexpensive helmets to add new sources. Added Adrian, Michigan, to our List of Mandatory Helmet Laws. Added three revealing articles on Bell Helmets. Listed Specialized's bike safety kit in our Toolkit for Helmet Promotion Programs. Added a new Researcher's Page. Added a quote on helmet usage in the Tour de France this year. We were "Director's Web Pick o' the Week" on the Batesville (IN) Memorial Public Library home page! Changed the format for our Web pages to the one you see above. Added our Update by Email on progress on ASTM standards. Added a page of helmet test labs. Updated our page on the status of ASTM helmet standards after the May meeting in Atlanta. Added a page with total visitors to our Home Page by week. Added a report on progress on ASTM standards at the May meeting in Atlanta. And a page on why the ASTM standard does not need vision requirements. Added a detailed comparison of the ASTM and CPSC bicycle helmet standards. Added a page on the status of ASTM headgear standards. Posted the agenda for the Atlanta ASTM Shirtsleeves technical meeting on May 7. Updated our page on head lice to add new info sources. Added a pamphlet on Teaching Your Child to Ride a Bicycle. With a version in Word format for printing out in Word. And a Word 6.0 version for printing out in Word. Added a page describing the 4 H Sports Grants for Youth program. Added our Update by Email on publication of the CPSC standard. Added a summary chart comparing bicycle helmet standards. Revised our Must I Buy a Bicycle Helmet for My Child? and added a Word version. 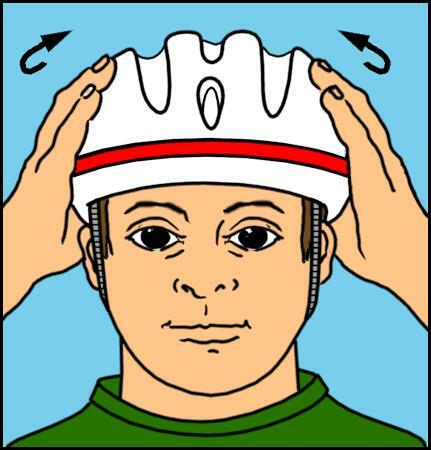 Revised our Consumer's Guide to Bicycle Helmets and added a Word version. Added a Word version of Teaching Your Child to Ride. Added a page of daily quotes for press people. Added a page on Teaching Your Child to Ride. Added a page on How to Fix a Helmet when it comes unglued. Added a brief on Bell Helmets Going Private. Added a short Summary of Helmet Standards explaining what they are. Added a page explaining how CPSC enforces its standards. Added our Full edition of the Update on approval of the CPSC standard. Added our Update by Email on approval of the CPSC standard. Added a link to a fine article from the Washington Post about the CPSC standard. Added a press release from CPSC on a jail term for violating CPSC rules. Updated our Frequently Asked Questions About Bicycle Helmets. Added a note that CPSC's final decision on their helmet standard has been postponed until February 5th..
Added a report on CPSC's January 21 meeting on their helmet standard. Added Jim Sundahl's letter to CPSC on their final draft standard. Added draft minutes from the December ASTM headgear committee meeting. Added info on CPSC's January 21 meeting on their helmet standard. Added info on our press policy on quoting our pages. Added info on ski helmets to our page on "Other Helmets." Added a page on how to tell the front from the back of a helmet. Added the new CPSC US Government bicycle helmet standard draft. Added a first cut on the new CPSC bicycle helmet standard draft. Sent the same text out as an email edition of the BHSI Helmet Update. Added a "white paper on helmet safety" from a new national campaign. Updated our basic ASTM page and our ASTM issues page. Added a page of quick answers to helmet questions. Logged a visitor from our 64th country, Trinidad and Tobago. Added a report on the innovative Maine helmet retrofit program. Added a report on the December ASTM headgear committee meeting. Added PTI to the page where you can check current stock prices. Added a page on the travails of bald riders.. Reorganized our Home Page to clarify the categories. Published the November issue of The Helmet Update. Logged a visitor from our 63rd country, Slovakia. Added a chart to convert measurements used in standards. Sent out the email version of our Helmet Update. Most of it is here in Helmets for 1998. Added a link to the new Consumer Reports Web page. Full access costs money. Added a note in Helmets for 1998 that CU found a Best Buy helmet. Added our review of Helmets for 1998. Added the agenda for the December ASTM F8.53 helmet subcommittee meeting. Added a Bicycle Retailer & Industry News article on our FOIA info on CPSC's buckle tests. Added an explanation of why car drivers don't see cyclists. Reorganized our list of mandatory helmet laws and added three Ohio cities. Reorganized our links page to make it more accessible. Added a model bicycle helmet law prepared by Safe Kids. Added "last revised" dates to the bottom of all of our pages. Added some stats on annual helmet sales to our industry page and our stats page. Upgraded our Web server with a new P200+ motherboard and a 10ms hard drive. Added Bike Helmet: Perfect Fit to our videos page. Best how-to-fit video we have seen. Updated our List of Mandatory Helmet Laws with new info on the Canadian City of Cote Saint-Luc. Added a link to the Moving Kids Safely Conference on November 16-19. Added a press release from advocates pressing Universal/MCA studios for helmets in Leave it to Beaver. Added 1996 data from the Insurance Institute for Highway Safety to our Statistics page. Edited our Comparison of Bicycle Helmet Standards. Added Carboro, NC to our list of mandatory helmets laws. Added Chemung County, NY to our list of mandatory helmets laws. Added the law requiring CPSC to issue a bicycle helmet standard.. Updated our FAQ on BHSI and its 25 year history. Added Steve Frothingham's terrific article for BRIN on new helmets. Highly recommended! Updated our When to Replace a Helmet page. Added a copy of California's bicycle helmet law. Updated our Most-Asked Questions About Bicycle Helmets FAQ. Added an article on traffic and head injuries in Vietnam. Added a link to the International Pro-Choice Bicycle Helmet Coalition, a European anti-helmet law site. Updated our link to Bell Sports and their FAQ on returning helmets. Added a copy of the Connecticut bicycle helmet law as revised to raise the age from 12 to 15. Added a brief on the New Jersey report that fatalities fell 60 per cent after their helmet law. Added a copy of the New Jersey press release. Revised our mandatory helmet laws list to add Connecticut's new cutoff: 15 years old. Added a link to Plum Enterprises: protective caps for non-bicycle use. Logged a visitor from our 62nd country, China. Might have been just another Hong Kong HK yesterday! Removed our text-only version. Robots would not leave it alone, doubling their hits on our site. Added a link to FARS where you construct your own query on fatality data. Added a BRIN article on our FOIA request for CPSC lab date. Added a letter from Consumer Reports defending their findings. Added Thad Ide's draft minutes of the May ASTM meeting. Updated our list of mandatory helmet laws, adding Manassas and Manassas Park, VA.
Added a link to PowerSlide, the Bicycle Police Netletter from Aiken, SC. Added a message from SEI warning about fraudulent uncertified helmets. Added a letter from PHMA questioning the Consumer Reports buckle test results. Added a medical journal article on bicycle child seats. Added an article on skaters' injuries from CPSC. Added our review of a new helmet article in Consumer Reports. Added a page on How to Fit a Helmet. Posted a brief about NHTSA adding "your bicycle helmet" to its annual "Buckle Up campaign. Added notes from the ASTM technical meeting in St. Louis last week. Updated our link to Headstrong Helmets. Updated the list of ballot items expected for the ASTM F8.53 Subcommittee's Form and Style Committee. Added our May Newsletter, the Helmet Update. Added our Report on Helmets for the 1997 Season. Added A page on evaluation of helmet programs. Added CPSC's acknowledgment of our FOIA request. .
Added a link to a personal injury page with another crash story. Added a Brief noting that Consumer Reports has announced that it will publish a helmet article soon. Added a Brief on our FOIA request to CPSC for helmet test data, along with a copy of our FOIA request. .
Added a Brief on a New York Times article reporting Harborview's call for a national helmet campaign. Added a message from an injured cyclist who can add the impact of his personal story to your helmet law campaign. Added Port Washington, Wisconsin, to our mandatory helmet laws page. Revised our mandatory helmet laws page. Added the LAB position on mandatory helmet laws. Added Barrington, IL to the list of helmet laws--all ages. Posted a Brief about an Australian study on facial injuries. Posted a Swedish study demonstrating injury reduction with a helmet program. Updated our helmet laws list with Washington State info from Ralph Wessels. Added a brief on the Snell Foundation's new Education Center. Added a pointer to the Washington State helmet bill now under discussion. Added an article saying that the government of Quebec has decided not to introduce helmet legislation. Added a brief on publication of Harborview research in JAMA, a major event. Added a brief on a Wall Street Journal article on the Snell Foundation. Added our activity statistics for 1996. Added an updated bicycle helmet campaign manual originally written by John Williams. Great! Added an article from Bicycle Retailer and Industry News about Bell's big helmet project. Updated our Program for 1997. Added briefs on the ASTM meetings in New Orleans, and some photos, too. Added a list of action items from the ASTM meetings in New Orleans, December 10 and 11. Added notes from the ASTM meetings in New Orleans, December 10 and 11. Added a link to the Ride Safe Web page, a great source of inexpensive helmets. Added a link to the new 50 cent bicycle stamp souvenir sheet and the two stamps alone. Added a brief on Bell's plans to produce a new super large size helmet. Added a page on the Protective Headgear Manufacturers' Association (PHMA). Added a page on advice for parents seeking extra-small helmets for tiny tots. Added a new dedicated fax number (our auto switch still works on the main line) and a new data number. Added NHTSA's Traffic Safety Facts 1994: Pedalcyclists to our collection of statistics. Ivanhoe Broadcast News mentions BHSI in this week's Fitness Factor on Helmets. Added the sixtieth country to our list of visitors--Romania. Updated our list of mandatory helmet laws with extensive additional info from Alex Fine of Safe Kids. Added Newport News, VA to the list of helmet laws. Added the 59th country to our list of visitors--Antigua. Updated our info on cheap helmets to add Aria Sonics and their $3.75 per helmet deal. Added some more descriptions of helmet manufacturers and a link to Headstrong's stock price. Added a page with the new helmet law exemptions permitted by British Columbia. Added the Rhode Island helmet law for kids under 8 and updated our laws list where we had been showing it as kids under 18. Updated our Helmet Standards Comparison with the 1996 Australian/New Zealand standard changes. Added our Helmet Update newsletter for September, the first we have published this year. Added a copy of the British Columbia mandatory helmet law. Added a link to Bell's latest quarterly report, which appears on the SEC's EDGAR server. Web site where there is a full copy. Added an article from the Wall Street Journal illustrating variables in bicycle statistics. Added an article from Bicycle Retailer and Industry News about the industry's satisfaction with new helmet designs. Added a page on child helmets. Added a link to a fine new page called BikePlan Source, with info on planning and programs to improve cycling conditions--primary measures to reduce the crashes that make helmets necessary. Added a brief on the new all-ages helmet law in British Columbia. Added the 58th country to our list of visitors. Updated our link to Steve C's page with his comments on helmets in London. Added a brief on Oregon's video to convince police officers to enforce their helmet law. Updated our description of the SEI certification program..
Added a page on issues frequently raised by helmet warriors on the usenet lists. Updated our Server statistics page. Added a brief on The WHO Helmet Resource Center opening this fall. Competition! Added some briefs on recent helmet studies, including two that question the consensus view. We've been picked by eye on the web as a Selected Site! Added their link at the bottom of our home page. Added a brief from Sam Boskey about helmet law developments in Montreal. Added a brief on an ANSI Committee vote: Snell or ASTM for ISO TAG administrator. Added a brief about a helmet law protest in Austin. Added a link to the new Consumer Product Safety Commission site, with information on their helmet standard, product recalls and hazards, research, and the agency's current calendar of meetings. Added a BRIN article saying that Bell is making data available on the Internet. Added a Site Map in addition to our Subject Index. Added a page on the Danish view of the CEN bicycle helmet standard. Added a Tool Kit page for helmet promotion program organizers. Added the 55th country to our list of visitors. Added a link to The Bicycle Accident Page. Added an article from Bicycle Retailer about Bell's President, Mary George. Added notes from an ASTM technical meeting before an ASTM headgear committee meeting. Added a page on Jaw Joint Injuries published by Dr Ed Williams. Added a page on helmets for non-bicycling activities. Updated our Helmet Standards Comparison. Added a BRIN article on Bell's third quarter profit..
Added the 54th country to our list of visitors. Added a link to the Snell Memorial Foundation site, with info on all their standards. Added Florida to the list of states with mandatory helmet laws. Added a message on bicycle helmet history. Added a page about the "Toy" helmet that appeared recently. Added a page on helmet manufacturers. Added info on the new West Virginia bicycle helmet law - 14th State to pass one. Revised our home page graphics. Added a brief quote from Jocelyn Pedder on new Canadian child's helmet standard: 200g's ! Added the 52nd country on our list of visitors. Added some statistics on our web server traffic here. Added The European Cyclists' Federation position paper on helmets from 1990. Added a brief about a new study recommending lower g's for helmet standards. Added Bedford, Texas, to the list of cities with mandatory helmet laws. Added a page of BHSI activity indicators for 1995 - how bhsi were we?. Added a BRIN article on Bell's second quarter loss. Upgraded our Web server to an IBM "Blue Lightning" to permit handling 16 simultaneous users. Added an index to our pages. Added our 50th visitor country, the Dominican Republic. Added our comments to CPSC on their draft bicycle helmet standard. Added a link to the Australian site with information on the 3rd International Conference on Injury Prevention and Control, Feb 18-22. The site has abstracts of some very interesting helmet papers, including two which are based on the Harborview study of child helmets and head injuries that is sure to be a landmark in this field. Added a link to The Cyclists Rights Action Group, an Australian site opposing helmet laws. Recommended for helmet warriors. Added a description of Ride Safe's discount helmets for 1996. Their lowest price ever. Added a description of the new Safe Kids video for kids up to age 14. Great video! Added a link on how the Blizzard of '96 has affected BHSI's physical neighborhood, This snow page has big, slow-loading graphics. From the cyberneighborhood point of view, traffic on our server was cut by at least 75 per cent, and for that week was mostly those of you from West of the Mississippi or from outside the U.S. We appreciate your visits! Revised our Robots page to reflect an increase in visits. Added a link to The Ontario Coalition for Better Cycling anti-helmet law page. Added notes from Les Earnest on the December ASTM meeting. Added the best study of helmet effectiveness that we have ever seen, by Australia's Dr. Michael Henderson. Added the official version of CPSC's second draft of its bicycle helmet standard including drawings. As an alternative, we have it without the drawings for faster loading. Added CPSC's Supplementary Material explaining how comments on the first draft were handled. Gap: February to December, 1995, before we started a Whatsnew page.